Where: American Powder Coatings, Inc. The Powder Coating 101 - Basic Essentials with Lab educational workshop is an introduction to powder coating that focuses on materials, application, reclamation, testing and evaluation, quality control, the manufacturing process, and much more. 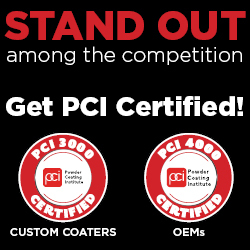 You will gain knowledge of powder coatings and the powder coating process from expert industry speakers as well as have an opportunity to network with speakers and other attendees during the PCI-hosted networking reception. All PCI training is conducted by industry experts in an unbiased and commercial-free manner. Registration fees include Powder Coating Finisher's Handbook, a copy of the presentations in printed booklet, lunch on day one, networking reception and certificate of completion.